Asparagus – Dig Delve – An online magazine about gardens, landscape, growing & making. Although asparagus only became prized as a culinary vegetable in Britain in the 17th century it was grown, and indeed prized, by the ancients as a medicinal herb and vegetable. The Romans even froze it in the High Alps, with the Emperor Augustus creating the Asparagus Fleet to take the freshly pulled spears to be buried in the snow for later. The tips, which are the sweetest part and known as the love tips or ‘points d’amour’, are always best when eaten fresh and, though we think nothing of seeing it on the supermarket shelves as an import, there is nothing like eating it in season, right there and then, when the energy of the new season is captured in young spears. So it is a good feeling to have planted an asparagus bed, as they represent longevity and permanence. Plant one and it will take two to three years to yield, but established crowns can easily crop for a couple of decades if you give them the care they need; namely good drainage, plenty of sunshine and little competition at the root. 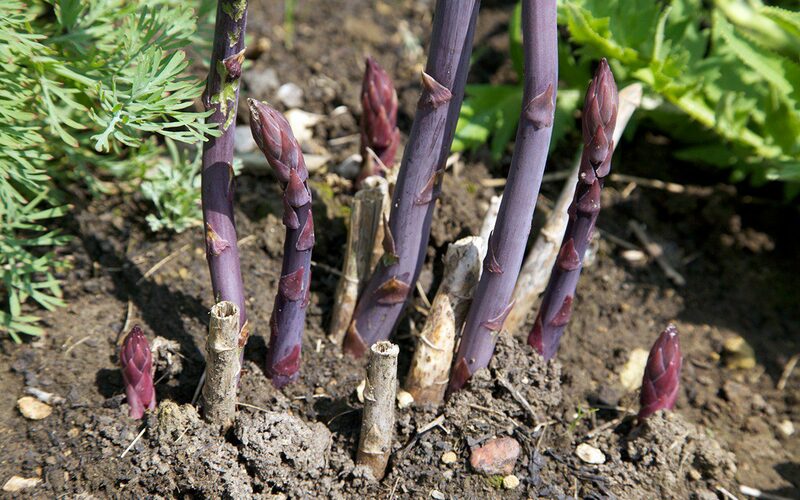 The roots, which radiate out from a crown in spidery fashion, are shallow, and hoeing is not advisable, so an asparagus bed is also a commitment to hand weeding. You will have to work for your reward. 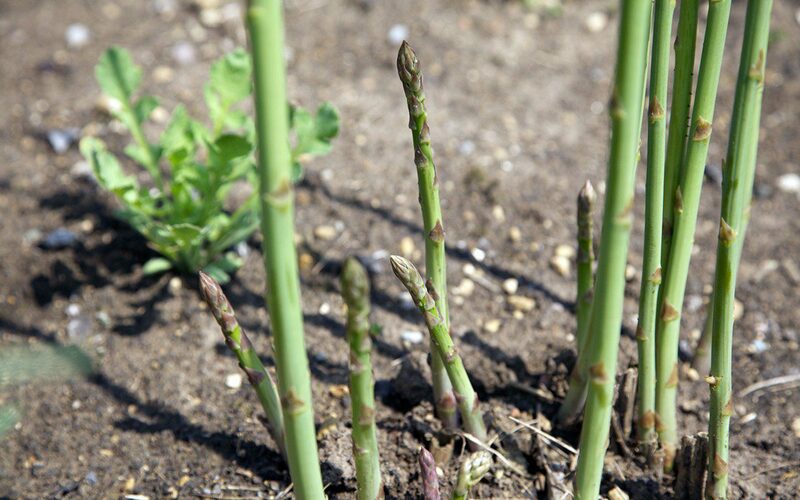 Being a coastal plant, Asparagus officinalis is tolerant of salt, indeed tradition has it that the beds be salted to keep weeds at bay. However, I do not. In truth my bed is far from text book perfect. 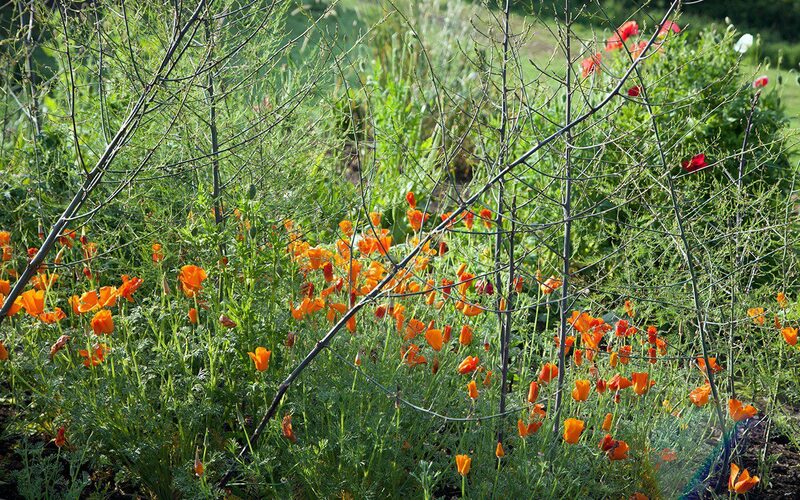 I have not raised it above the surrounding ground like the carefully drawn diagrams in the books, and the Californian poppies and Shirley poppies have seeded into the open, weed-free ground to become the, admittedly attractive, weeds in the patch. I winkle the Eschscholzia out where they seed too close to the crowns, but leave a handful, as they like the same conditions and sit brightly beneath the fronds once the asparagus is allowed to grow out after cropping. The few plants that are female pepper themselves with scarlet, pea-sized fruits, which hang in suspension like beads caught in a net as the fronds fade to butter-yellow later in the season. It is a fine but unadvisable association, if playing things by the book is your thing. 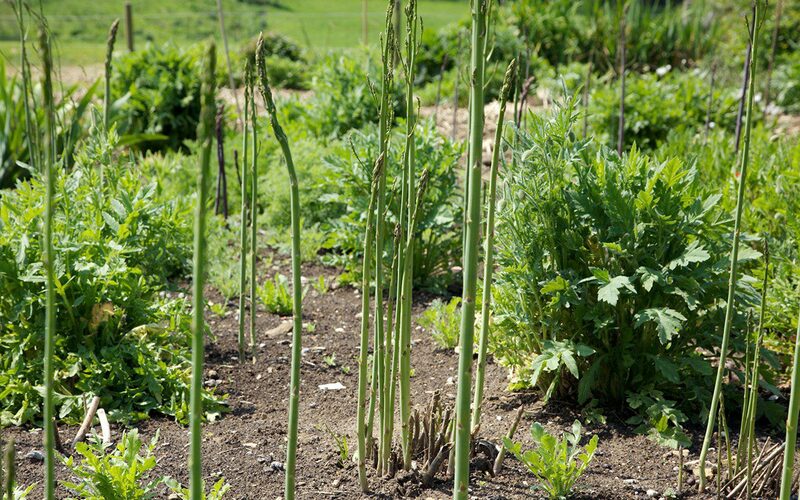 Our first asparagus bed was planted four years ago in the original mixed vegetable and trial garden. The crowns, which are best planted bare-root in the spring, arrived by post and were carefully planted in late April. The soil was manured the previous summer and the crowns laid out on an 18” grid. The books advise two feet between rows, but our slopes are sunny and the ground hearty, so I took the risk with a closer planting. I opened a trench and fashioned a little mound of soil for each plant to allow the roots to radiate out, down and away from the crown. The trench was then backfilled with the crown just below ground level and marked with a cane to protect the position of the first emerging spears. Over the first year the crowns gather in strength, each frond outreaching the next so that, by the end of the first summer, they are already showing their potential. It is essential to wait before cropping to allow the plants to build up their reserves. I cropped them for the first time last year, but took only a few spears to avoid weakening them. This year, there will be no need to hold back. I bought two varieties initially, both male, so I am not sure how I have females in the mix, but no matter. Male plants are more productive and so, according to the rules, the berrying females should be weeded out. ‘Connover’s Colossal’, an old 19th century variety, is a reliably strong cultivar, but ‘Stewart’s Purple’ has been disappointing. It is supposed to be higher yielding than many of the green varieties, but you only really know and understand what a plant’s habits are when you grow it for yourself and, for me, ‘Stewart’s Purple’ doesn’t cut the mustard. A third of the plants have failed and, although the spears are a beautiful inky purple colour and deliciously sweet, even the plants that have survived have cropped very erratically. They require far too much space to waste on such a meagre harvest. Anthocyanins, which give vegetables and fruit their purple colouring, are valued as antioxidants, but I wouldn’t grow this variety again other than to possibly work it into the herb garden as an ornamental. Here, with moody fronds rising up prettily above chives and purple sage, occasional spears could be harvested and thinly sliced raw into salads. There is an associated guilt attached to my original asparagus bed, which comes from the knowledge that the bed could never have been long-term. I always knew the test garden would give way to a new ornamental garden and, over the last couple of years, I have been relocating the vegetable garden to the other side of the house. The diggers are coming in shortly to shape the land for the new garden, but the asparagus bed will remain for one more year, like a boat anchored off shore. Last spring I planted an F1 variety called ‘Gijnlim’ in the new vegetable garden to pave the way for the hand over from the old bed to the new. 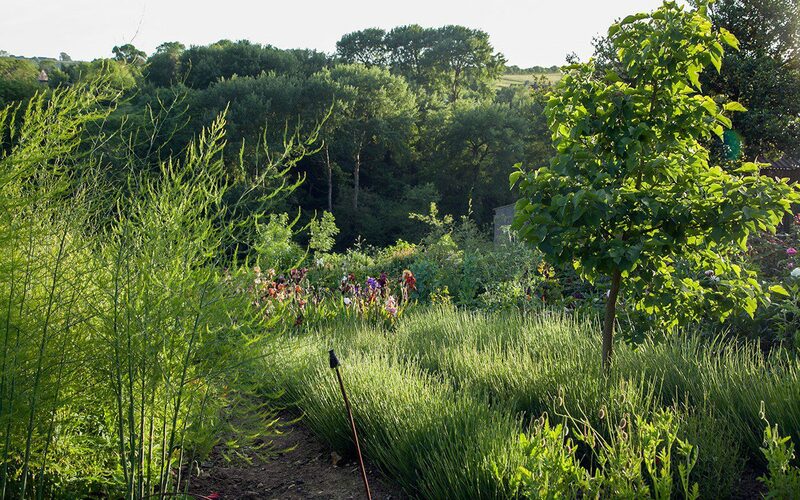 Having been selected for its hybrid vigour ‘Gijnlim’ is said to crop within a year, but I am still leaving it this year to build up reserves, mulching the bed with home-made compost before the spears emerge. It won’t be easy to cut my old bed adrift when I have to later in the autumn, but for now we are enjoying the luxury of eating the spears absolutely in season, when the garden is beginning to rush with energy. When a bed is up and moving in the spring, you can visit it daily for three weeks or so of harvesting. A sharp knife inserted carefully at the base of a spear and just below ground level is the best way to pick what you need, but be careful not to damage the crown. See it as a surgical exercise and, for best and sweetest results, pick just before you eat. Steam and serve al dente and every mouthful will be worth the commitment. If you read up about asparagus yields to try and arrive at an ideal number of plants for a bed that suits your needs you get wildly differing advice. An American website says that 24 plants produce enough for a family of four. Big portions I’m guessing, but advice closer to home advises ten to twenty plants for the same number of people. We have sixteen crowns in the new bed and hope that this will be plentiful enough to pick what we need without providing a guilt-inducing glut. I’d have liked for there to be two varieties, so that we have an early cropper and a late, but we have had to draw the line somewhere. There is only so much ground that can be committed to perennial vegetables, even one as delectable as sparrow-grass.